Espresso with white chocolate flavoured sauce and steamed milk. Topped with sweetened whipped cream. 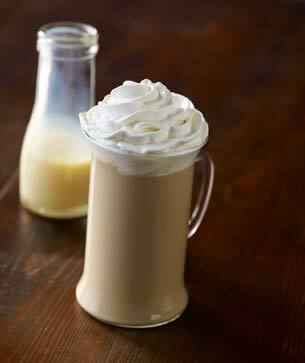 Fans of white chocolate will tell you that they love it for its elegant, creamy taste. That its smooth subtlety makes it a perfect complement to bolder flavours. Well, there aren’t many flavours bolder than our rich, full-bodied espresso. And as it turns out, there aren’t many better ways to experience the decadence of white chocolate than in this delicious beverage. White is not merely a colour; it's actually the combination of all visible colours of light in equal proportions.